Apple iPhone 6 is available to purchase at a price Rs. 9,990!!! This is really a surprising news for the iPhone lovers. This is a bit crazy, but it is true. The previous variant of Apple, iPhone 6 smartphone can be bought on Flipkart as low as Rs. 9,990. But there’s a twist in the tale. Under a new Exchange Offer, the e-commerce giant Flipkart offering a huge discount of Rs. 22,000 on 16GB Space Grey colour variant. In addition to that, the further 5 percent discount will avail if users purchase the product using bank cards. Hence the total discounts add to almost Rs. 27,000 off on the device. Currently, the price of iPhone 6 price is Rs. 31,990, but surprisingly you can buy it for less than Rs. 10,000. Flipkart provided the list of smartphones for the Exchange Offer, and it goes maximum upto 22,000 discounts on old smartphones. The discounted price is available only for the iPhone 6 Silver Grey 16GB model. The company particularly mentioned that the Exchange Offer depends on the models user exchange. The most interesting note is that this offer is mainly applicable only on Apple iPhone 6S device. Hence, whoever with iPhone 6S can exchanges their mobile with iPhone 6. Apple launched the iPhone 6 in the year 2015, and the newest smartphone from the company is iPhone 7. 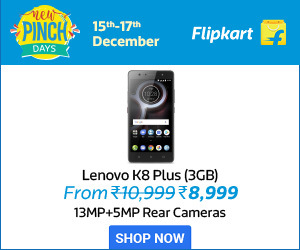 However, Flipkart is also offering the exchange discount upto Rs. 22,000 on all iPhone 7 and iPhone 7 Plus models. One of the highlights of iPhone 7 is that the base variant comes with 32GB and Apple traditional home button and 3.5mm audio jack removed. In addition to this, the iPhone 7 Plus launched with the dual camera technology for the first time.